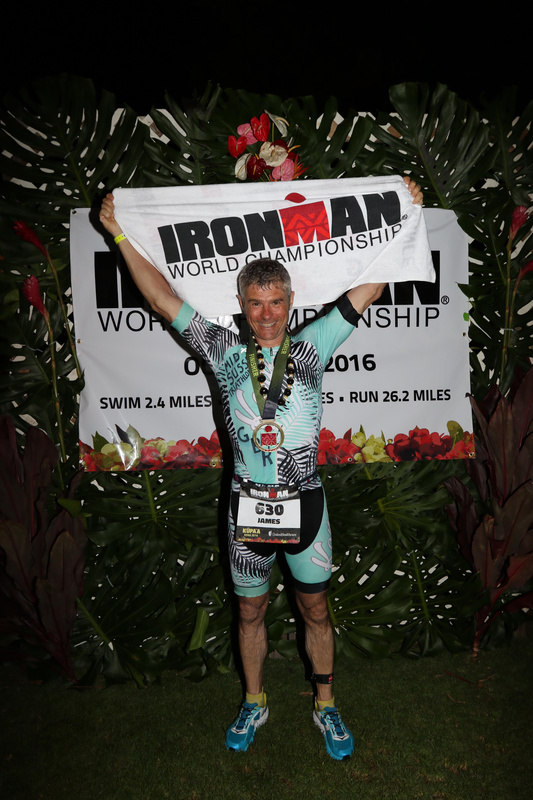 Mid Sussex Triathlon Club member, Jim Graham, was fortunate enough to get a legacy slot for the 2016 Ironman World Championship in Kona on 8th October 2016. The 11:26 finish time ranked in the top half of age group. This was a very pleasing result despite being 1:41 slower than PB. Kona is THE Iconic Triathlon Venue and you don't need to be racing in the main event in order to participate or enjoy the experience. Kona is a lovely super-friendly town with lots of preliminary events, banquets, tourism and partying. Being a volunteer marshal for the main race is really rewarding. The whole town is a giant expo for race week and there are loads of free hats, shirts, gels, lubricants, cycle-bottles etc. There are numerous pros and former world champions to spot, listen to and chat with. WTC (World Triathlon Corporation) have this race week as their annual celebration so everything is lavish and grand (despite there being a relatively small select group of main event racers compared to mega-races like Roth or Frankfurt). Inevitably, long distance triathlon would have arisen eventually in one or several places in the world. The fact that Hawaii was the location that established the specific iron race distances is probably fundamental to the current huge appeal of triathlon. This course and the pros who have excelled here have become legendary. Imagine being in a sauna for up to 17hours doing continual multi-sport. That is what the Ironman World Championship is like. However, Kailua-Kona in Hawaii is a beautiful tropical paradise with very hospitable friendly locals, so the race is an absolute pleasure despite the challenging conditions. It is a humbling experience. Many elite athletes in their prime (with Ironman podium finishes elsewhere in the world) suffer at Kona and fail to finish or get beaten by 70 year olds. By the way, some of those 70 year olds are super-human and can beat all of our PB's. Currently about a quarter of a million triathletes compete each year in qualifying races to try to get one of a couple of thousand places to the Ironman World Championship in Kailua-Kona, Big Island, Hawaii on the second Saturday each October. Some events seem a bit easier than others for qualifying but you always need to finish in the top 1-2% of age group. Annually, there are about 100 legacy slots distributed amongst those who have completed more than a dozen official Ironman full-distance races. There are a handful of executive and charity places available in order to raise money for good causes (one charity is currently asking for a thirty-five thousand pound bond/pledge from the athlete who takes the single slot that they have for 2017). There are a handful of slots for disabled athletes and for the US military. There are about 100 professional slots, but obviously those are impossible for normal human beings to get. This year there were only 9 UK professionals good enough to reach this standard and 2 of these failed to finish. Getting a Kona slot is a bit overwhelming, because of the thought of competing with the world's best. Even if you have your best race ever, you will still most likely rank low in age group and finish considerably slower than PB. Training was was all about doing this series of races then avoiding injury in order to get to the Kona start-line intact. Kona exceeded all expectations. As soon as you get off the plane it is clear that Hawaiians take great pride in being kind, patient and hospitable. Literally an island paradise and also the Ironman event does live up to the hype. My wife, Helen, probably had a better week than me because there was so much great stuff to do and no worries for her about saving energy for the the big race. The bike racks and transition on the pier were immaculate. Every inch carpeted and nothing out of place. Not too cramped for space. This was one was clearly going to be different from other races. Terrific kind attention from the army of volunteers and marshals. The excitement and expectation was palpable. Sensational sunrise as we did the final bike check then waded into the water for the start. Seen it on TV, dvd's and on youtube many times. Unreal. The mass start at Dig-Me Beach and the cannon going off. Wonderful. Felt like "home", despite being almost as different from a UK triathlon start as it is possible to be. No particular stress or worries about that swim in that lovely clear warm tropical calm water. Nothing to prove on the swim but slight anxiety that any number of bike issues could spoil this (possibly once in a lifetime) experience. Sensibly, I seeded myself with the slowest 10% (far to the left of the pier). Beautiful warm clear waters with lots of fish. I had gazed at the sea-life and sighted the tropical landscape every morning for the last week but on race day it was the same pair of feet to look at for most of the 1:27 swim. A massive non-neoprene swim PB for me but one of the slowest swims of the day in this elite field (2100th out of 2316). It was all serene until the final half mile when the top female age-groupers (who had set off 15 mins later than the men) bombed past and over me. No problem finding my bike bag or bike in T1 as the bulk of my age group were long gone. There are some slightly tricky sections at mile 2 and mile 4.5, so I took it easy and settled down. This cycle must not be ruined by a stupid accident. The plan was to drink 1500ml per hour (yes, 1500ml!) and not get in an accident or get a drafting penalty. It seemed almost impossible to drink that much but experts say it is needed at Kona. The heat, high winds and humidity readily cause dehydration plus salt depletion. Feed stations every 7 miles were needed in order to get enough to drink and to constantly drench body in water. One bottle-cage was just for water to drench body in between feed stations. There appeared to be double the usual number of draft-buster motorbike marshals and the penalty tents were always full. A rushed 4 minute T1 caused insufficient suncream application, so the subsequent fear of sunburn encouraged quicker pedalling. The gusts of wind in the northern half of the bike course were extreme and it was good to not have deep rims (Zipp 303 front and 808 rear did the job nicely). Paced it nicely using heart rate monitor and overtook lots of people in the last 30 miles. The 5:55 cycle was pleasing and the DIY bike constructed from eBay second-hand parts and duct-tape performed perfectly. It was a massive relief to start the run and feel confident that this most important of all races would now be completed. Extreme overheating potential was mitigated by feed stations every mile issuing fluids, sponges, gels and ice. It was good having the drink bottle carried in the tri-suit back pocket to provide extra drinks in between each feed station. Lots of ice was stuffed under tri-suit and hat but it mostly melted within 10 minutes. Lots of supporters on the course had hoses to cool us. Those who overheated had to slow down but fortunately, I kept a good pace even in the infamous hot microclimate of the 4-mile "energy lab section". It was great feeling strong during the hot airless ascent out of the "energy lab" (just before mile 20) and thereafter gradually increasing pace to overtake many athletes until completing the run in 3:53. The final half-mile mile was an ecstatic sprint ending in a mad dash to the finisher's arch. Too pumped-up with emotion to slow-down and pose for pictures. Stuff of dreams. Helen was a volunteer marshall for the finish-line and I literally ran into her arms, which was a very special moment to complete a wonderful event. Next day was spent chilling out, packing the bikes and attending the Champions Banquet Awards Ceremony. Being placed 101st out of 203 starters in the 50-54 male age group was almost unbelievable. How could I have beaten that many athletes at this race when for 8 years of trying (16 previous Ironman races) those guys had been beating me and grabbing all the podium places? I would have been content to beat just one of them in order to prove that my participation in the World Championship was justified. Big Island Hawaii is literally still growing, with huge quantities of red-hot lava being deposited on land and at sea every day. A couple of days after the big race we found ourselves jogging for miles in the lava fields to get access to the latest up-close viewing places. At sunset the bubbling lava glows spectacularly and it looks like the end of the world and the beginning of the world simultaneously. This is the race report that I have dreamt about writing since first doing a local sprint triathlon in 2008. Some people apparently have sufficient ability to get a Kona slot at will. For most of us it is nearly impossible and that makes this achievement sweeter. My journey has been blessed with plenty of help and support from family and friends. Mid Sussex Triathlon Club is full of so many inspirational people who provide lots of positive energy and all of our successes should be considered a team effort. It was fantastic for me to share this experience with my most important person (Helen). The next time someone from our club gets a Kona slot, we should rent out a decent sized house for race week and have a large club gathering as that would be awesome. The flights would be the main expense, then we could survive on the free hand-outs of isotonic drinks and energy bars/gels. Expenses could be off-set by selling all the accumulated free hats and tee-shirts on eBay when we get home.